Meet current and previous BEST scholars from 2018, 2017, 2016, 2015, 2014, 2013, 2012 and 2011. The Brown Executive Scholars Training (BEST) Program is designed to expose doctoral students and advanced master’s students to careers in higher education administration. 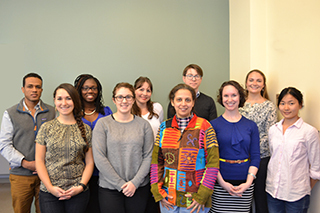 Every fall eight to 10 graduate students are chosen to participate in this 12-week mentored, education and training program. This program was established in 2010 and is sponsored by the Graduate School and the Office of Institutional Diversity. To help prepare graduate students for future leadership roles in higher education administration through a semester-long, mentored education and training experience. Educate graduate students about university administration and the roles and responsibilities of senior administrators. Expose graduate students to senior administrators through one-on-one mentoring relationships and professional development activities. Enhance the leadership skills of graduate students who aspire to pursue careers in academic administration. Hear from program alums about their experiences! Scholars will be allowed two excused absences throughout the duration of the program. Scholars with excessive absences may be dismissed from the program and will not receive certificates of completion. The program will run from late January to late April. Scholars will spend up to 30 minutes reflecting on topics related to each seminar either before or after the presentation. These discussions will be facilitated by BEST Program staff. Scholars may also engage in professional development activities such as CV-resume writing and receive tips on how to identify and highlight transferrable skills. Scholars will be paired with administrators from key areas of the university to learn about their specific role, the function of their area and to receive advice and support related to their own pursuit of a career in academic administration. Scholars are expected to meet with administrative sponsors for no less than one hour at least once each month and may engage in an optional mini-practicum project. Senior administrative staff from across the University will help select a diverse and cross-disciplinary cohort of promising scholars. Meet previous BEST scholars from 2018, 2017, 2016, 2015, 2014, 2013, 2012 and 2011. Scholars will complete a skills and expectations pre-survey, individual seminar evaluations and an overall program-ending post-survey. Applicants must be an advanced master’s student or doctoral student. Master’s degree students must have completed at least one semester of full time coursework in their current graduate program prior to the beginning of the B.E.S.T. program. Complete through UFunds, See under “Graduate School Distinctive Opportunities” – application to go live Sept. 24. These messages of support should be emailed separately to [email protected]. For any questions, please contact [email protected].